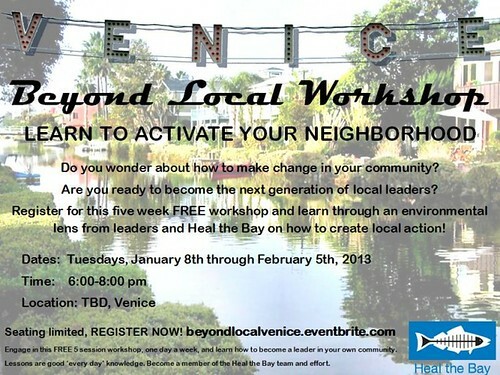 Heal the Bay: Venice 'Beyond Local' Workshop - Yo! Venice! Do you wonder about how to make change in your community? Are you ready to become the next generation of local leaders? Wondering how communities like Venice can push the City of LA to be greener and healthier? Join us for this five week FREE workshop (January 8, 15, 22, 29, and February 5, 2013 from 6:00 pm to 8:00 pm)! Attendees must be 18 or older.